We publish hereunder a brief note on some of the demands included in the ten point charter of demands, which are of utmost concern to Central Government employees in pursuance of which we have decided to embark upon the one day strike action on 7th September, 2010 along with the other sections of the working class. The affiliates and State Committees may kindly take necessary steps to circulate the same amongst the members. The State committees are especially requested to kindly translate the same in the vernacular if possible so as to ensure that the message contained in the Note reaches the employees. 1.On price rise and the PDS. The Economic crisis in nineties caused primarily by the indiscriminate borrowings indulged in by the Government of India especially from the world bodies like IMF and the adherence to their conditionalities) created a conducive climate for the proponents and champions of market economy to advocate the globalization path of economic development. The State began to withdraw itself from various sectors and the least governance was considered as the virtue and synonym for good governancne. In other words, the Government withdrew itself from the concept of welfare governance and opted for faster economic development through privatization, liberalization and globalization. The agony and misery of common multitude, the consequence of adoption of market economy was considered by the rulers as the price to be paid in the process. The various subsidies provided to ensure that the essential commodities needed for human existence is made available to the common people was treated as a profligacy and concerted efforts were made to cut them drastically in budget after budget presented to the Parliament. The media both print and electronic which had gone into the hands of large corporate houses by then propagated the liberalization and globalization policies to the hilt and inside the Parliament various legislations were moved and enacted by the ruling class supported by the dominant opposition parties, with the sole exception of the Left parties. The Working class organizations except those affiliated to INTUC and BMS realizing the dangerous impact on the lives of the common people decided to oppose the neo-liberal economic policies by strike and other demonstrative actions. Between the period 1991 and 2008, the sponsoring committee of Central Trade Unions along with the different Federations of employees organized strike actions on 12 occasions which indeed made deleterious impact over the pace with which the Indian ruling class wanted to usher in these policies. Not only the common people, but also the intellectual and the middle class had to admit albeit reluctantly that but for the consistent opposition of the left parties and the working class organizations, the global financial crisis that engulfed the American and European Continents and many other parts of the world would have destroyed the Indian economy. To tide over the ripple it created in the Indian Economy, the Government had to make outflow of crores of rupees in the name of bail-out packages to Indian Industry. Once the crisis is blown over, the Government has gone back to its good old days of implementing these discredited policies with a vengeance. The unbridled accumulation of wealth in a few hands, the cardinal consequence of the capitalist economic development bring about a pyramidal society giving no room for the poor people at the base even to eke out an existence. This aspect became more and more pronounced over the years and reached a stage that it became impossible for anybody who is supposed to be representing the workers to continue to ignore this phenomenon. Those organizations which had taken a contradictory stand against the sponsoring committee had to come together to voice their concern against the marginalization of the working people. Both BMS and INTUC had to join in the concerted efforts of the workers to oppose, if not the policies, at least the manifestation of it, especially the escalation of prices of essential commodities. The inflationary impact in the economy created by the pursuance of the neo-liberal economic policies mostly engineered was conceived to effect a transfer of wealth from the poor to the rich. The inflationary impact reached an intolerable stage in as much as its incremental rate from quarter to quarter was in two digits .Never in our post independent era had it assumed the dimension of today with the result that all opposition political parties in the country had to rally round inside and outside the Parliament to denounce the Government of inaction and the 5th August Nationwide bandh became total and resonant. In the immediate years after independence, in order to ensure food security to the people of India, the Indian ruling class under pressure created the universal public distribution system especially for food articles. It became an effective instrument in the years to contain the artificial rise of market prices of essential commodities especially in the face of hoarding and black market operations of unscrupulous traders. The sweep and range of commodities made available through these outlets, known as ration shops in the common parlance even though beset with innumerable problems connected with leakages and corruption, was the most effective welfare measure of the Government of India, which in no small degree arrested and stopped the starvation death in rural India. The advent of neo liberal economic policies ensured that this singular welfare measure of universal public distribution system was discarded. Both inside and outside Parliament our Present day rulers advocated that the higher prices are inevitable given the shortfall in domestic production and prevailing higher prices of rice, wheat, pulses and edible oil globally. Far from truth the statement was, as the production of food-grain in 2006-07 in our country was 9.3 cr. tonnes, 9.6 crores in 2007-08 and 9.9 crores in 2008-09 despite the fact that our investment in agricultural sector in the last ten years was less than 2% of the GDP and constantly year after year the Government had been withdrawing subsidy to the farm sector. Primarily to ensure that the universal PDS is in operation, and the peasants do get remunerative price for their produce, the Government had created a buffer stock of food-grains. The statutory norm fixed was to have 200 lakh tonnes of wheat and rice as buffer stock. Presently the FCI godowns carry 475 lakhs of food-grains. Of it 3 million tones are reported to be rotting for want of space in the warehouses and rats the beneficiaries. This made the honourable Supreme Court to ask the Government as to why that which cannot be stored properly be distributed to the poor. While dismantling the PDS destroyed the food security enjoyed by the poor, the permission granted to speculators to indulge in forward trading in food articles with an intent to artificially boost the statistical growth of economy resulted in the soaring of prices in the market. The fervent appeals made by the informed public, intelligentsia in the society and the Parliamentarians belonging to the left parties to ban forward trading fell in the deaf ears for that would have entailed in the slowing down the reforms, which course the UPA II Government had vowed to intensify. Despite the reportedly enviable growth rate of 8 to 9% over the past few years and the consequent rise in the per capita income of our country, vast majority of our countrymen have become poorer while the number of dollar billionaires were doubled. According to Shri Arjun Sengupta report, 77% of Indian population have a daily income of less than Rs. 20. And the Tax concessions, deduction and exemptions given away in the last budget to those who can afford to pay the levies was of the order of Rs. 5.18 lakh crores. It is on the top of all these, the GOI recently hiked the petrol prices perhaps the nth time the UPA is in power on the specious plea of helping the Public Sector Petroleum marketing companies out of the under recoveries. In the context of IOL making a profit of 10998 Crores in 2009-10 and the respective figure for HPCL and BPL being Rs. 544 Cr and 874 crores and the Govt. of India making a neat additional tax of Rs.86,000 crores (Rs. 110000 Crores minus State share of Rs. 24,000 crores), this fiscal, only an insensitive Government alone can resort to these measures. This being the general scenario which must be of concern to us rather of grave concern, it would be pertinent to note the erosion in our real wages brought about by the unprecedented escalation of retail prices of commodities of daily consumption. The 6th CPC determined the minimum wage on the basis of the retail prices of various commodities as existed on 1.01.2006. (Please see page 53 of the 6th CPC report). We are unlike those in the unorganized sectors in the company of those segment of the working class, who get their wages cost indexed, howsoever, defective, trivial and insufficient it is. Therefore, we get 35% addition to our wages in the form of DA ( raised to 45% by the recent hike). From the table given hereunder we can see that the average rise in the prices of those commodities which are taken for the computation of minimum wage has been of the order of 175%. Fill up all vacant posts and lift the ban on recruitment. Stop outsourcing contractoisation of Governmental functions. "Increasingly' basic work relating to cleaning, sweeping, maintenance etc. is being outsourced. This is a welcome trend that needs to be encouraged by bringing about systematic changing in the existing scheme so that the employees in Govt. are only utilized for requiring a certain levels of skills". It is a fact that majority of the functions presently carried out by the Gr.D. employees across the Board is unskilled. What had actually been done by the Commission is to abolish the unskilled functions in the Governmental sector and pave way for more and more contractorisation of these jobs while the existing employees (whose working strength has become less than 50% of the sanctioned strength) might be classified as Gr.C. and assigned to do functions which are of skilled nature with lesser emoluments than what it could have been even as per the V-CPC recommendations. It is therefore, a disastrous recommendation. In the days to come the unskilled nature of jobs would be either outsourced or would be contractorised. This recommendation therefore, is not for the benefit of the existing employees who are recruited as unskilled workers. Now the recruitment will hereafter become unavailable in the Governmental sector for those who are in the lower strata of the society who could not afford or who are not provided even the primary education even though the universal primary education is stated to be the objective and goal of a welfare Government as per our constitution.. In fact they are being punished for the social inability or abdication of the responsibility on the part of the Government to provide them with a decent standard of living or the nascent requirement of primary education. The recommendation is therefore, a by-product of the neo-liberal economic policies pursued by the Govt. since 1991 which we have been fighting against all these years along with other segment of the working class. As has been feared, the Government has now decided to ensure that all unskilled jobs are contractorised. The guidelines issued by the Department of Personnel for the Mutlti-tasking staff makes it mandatory that the future recruitees to the government service has a minimum educational qualification of matriculation. The recruitment will be done through the Staff Selection Commission. These personnel may not be deployed for the unskilled jobs like that of sweeper, farash, mali, watchmen etc. These functions would naturally be contractorised. The Department of Personnel has already advised all concerned to go in for contractorisation of these functions. The workers so recruited by the contractors are not to have any job security as they will be liable for the hire and fire system. In the background of the continuing ban on recruitment, many of the Government organizations has resorted to outsourcing of their functions which are of permanent and perennial nature to agencies on fixed rates. The very fact that the Government has made available funds for the Departmental heads to resort to outsourcing establishes the policy being pursued by the Government. The functions hitherto being carried out by the Group C employees and the Group B Non gazaetted are liable to be outsourced. Once the system is established, there will be no likelihood of any fresh creation of posts in these cadres. The large scale computerization has helped the outsourcing as a fesible proposition. 3. Regularise the Daily rated workers, GDS, remove ceiling on compassionate appointments end discrimination in the grant of bonus to GDS employees. In the background of the continuing ban on recruitment, quite a number of workers had been recruited in Government service on daily rated basis. Many of them have completed more than a decade in Government service. They had been on the pay roll of the Government to carry out the functions of a permanent and perennial nature of jobs. The resort to recruitment of daily waged workers to carry out the functions which are clearly permanent and perennial nature is in clear violation of the extant instruction in the matter. Having elicited their service for the past several years, they should be regularized as permanent employees with all concomitant benefits. Retrenching them to be replaced with fresh daily rated workers is impermissible. Similar is the case of GDS employees in the Postal Department. The system a colonial concept ought to have been discarded long time back. The functions entrusted to the GDS in the Postal Department are of permanent nature. Some of them are required to do more than 8 hours work a day. Many of the post offices, especially in rural areas are manned by the GDS and the postmen are required to function continuously for more than 8 hours a day but still paid as a part time employee. There should be a system by which these employees who are recruited as GDS are absorbed as regular employees after a pre determined number of years of service. Another issue pertaining to the GDS is the unjust denial of the benefit of the raised quantum ceiling on bonus calculation. While the Bonus Act was amended by the Government, raising the emoluments ceiling for the purpose of calculation of bonus from Rs. 2500 to 3500, it was extended to all civil servants except the GDS. Most of the GDS has a monthly emoluments beyond the limit of Rs. 3500. There is no justification for denying this benefit to them. Remove the arbitrary 5% ceiling and 3 years condition on compassionate appointment and withdraw court cases and absorb all waitlisted RRR . On the pretext of the directive of the Supreme Court, Govt. introduced the concept of a 5% ceiling on the compassionate appointment. The fact was that there had been no such directive from the Honourable Supreme Court. There had been no rhyme or reason for this stipulation. Despite the repeated discussion on the subject at the National Council and its Standing Committee and the solemn assurance given by the Cabinet Secretary in the wake of the last strike action, nothing has been done in this regard to resolve the issue. It is pertinent to mention in this connection that the compassionate appointments in the Railways continue to be operated without any such ceiling. Moreover in the Department of Posts hundreds of compassionate appointment candidates selected by Selection Committee are being denied jobs and attempt to oust them is on. Through legal stay orders these candidates known as RRR Candidates are fighting the battle. The Government should withdraw the SLP filed against them and absorb them all as regular employees and withdraw the orders imposing and arbitrary ceiling of 5% and non-consideration of the case of candidates whose applications are pending for more than 3 years. 4. Grant statutory defined pension scheme to the employees recruited after 1.1.2004 and withdraw the PFRDA Bill from Parliament. The present defined benefit scheme of pension was introduced replacing the then existing contributory system. As part of the neo liberal economic policies, the Government decided to reconvert the same into contributory and make the fund available for the stock market operations. It is the vagaries of the stock market which will determine the pension returns from this fund. Before the introduction of the PFRDA bill, the Government had set up a committee under the chairmanship of Shri Bhattacharya, Chief Secretary of the State of Karnataka. The bill has been drafted and presented to the Parliament disregarding even the recommendation of the said committee to the effect that the Govt. should consider introducing a hybrid system by which the employees will have a defined benefit, if they choose to be satisfied with the said return and can opt for a higher return through stock exchange investments. The Bill could not be passed in the Parliament as the Left Parties took the principled position that they would not support a proposal detrimental to the interest of the employees. Despite the non passage of the bill and the consequent absence of a valid law to support the Pension Regulatory authority, the Govt. has converted the existing pension scheme into a contributory one and invested a percentage of the fund so generated from the employees contribution in the Stock market, whose index has crashed to one third of the value at the time of investment. Pension is earned by an employee by rendering service and therefore there is no requirement of any payment by the employee for earning pension. This statutory right of the employee is enforceable through courts. The Supreme Court has declared pension as one of the fundamental rights. The government should therefore retrace from its avowed position, which is detrimental to the interest of the employees and ensure that the employees recruited after 1.1.2004 is covered by the existing statutory defined benefit scheme by withdrawing the PFRDA bill from the Parliament. Continuing with the colonial concept of denying the Civil servants the privileges enjoyed by the other sections of the society is a matter of great distress. Article 309 of the Constitution makes it incumbent upon the Government of India and the Provincial Government to make enactments to regulate the service conditions of the civil servants. The Indian Parliament had no time to make such enactment. In fact the Indian ruling class wanted no such enactments. The transitory provisions empowering the President of India to make rules till such time the enactment is made has been employed to regulate the service conditions of the Government employees. Once recruited as an employee, the ILO's conventions provide all trade union rights. India is a signatory to those conventions. Despite all these legal and moral obligations on the part of the Government, the Government employees continue to be denied the right to collective bargaining. No negotiation is worth the meaning, if the employees have no right to withdraw their labour in case of a non satisfactory agreement on their service conditions. It is this legal lacuna which was employed by the Supreme Court to justify the arbitrary dismissal of lakhs of employees by the Tamilnadu State Government when they resorted to strike action. In the judgment delivered by the Supreme Court, it was observed that the Government employees do not have any legal, fundamental or moral right to resort to strike action. It is all the more an injustice especially when the Government considers that strike is a right of the workers in the Public Sector undertaking and that of the private enterprises in the country. It is paramount that the Government employees do have the right to strike in order to force upon an agreement for better wages and service conditions. Placed hereunder is the strike notice being served by the Confederation on the Government. Kindly ensure that all affiliates serve the strike notice on their respective heads of Departments and the units on their respective heads of offices by including as part II, the department specific demands which are long pending. This is to give notice that the employees who are members of the affiliates of the Confederation of Central Government employees and workers will go on one day's strike on 7th September, 2010. The charter demands in pursuance of which the employees will embark upon the one day strike action is enclosed. 1. Price rise of essential commodities to be contained through appropriate corrective and distributive measures like universal PDS and containing speculation in commodity market. 2. Concrete proactive measures to be taken for linkage of employment protection in the recession stricken sectors with the stimulate package being offered to the concerned entrepreneurs and for augmenting public investment in infrastructure. 4. Steps to be taken for removal of all restrictive provisions based on poverty line in respect of eligibility of converge of the schemes under the Unorganized Workers Social Security Act 2008 and creation of National Fund for the Unorganized Sector to provide for a National Floor Level Social Security to all unorganized Sector workers including the contract/casual workers in line with the recommendation of National Commission on Enterprises in Unorganized Sector and Parliamentary Standing Committee on Labour. 5. Disinvestment of shares of Central Public Sector Enterprises (CPSEs) is not resorted to for meeting budgetary deficit and instead their growing reserve and surplus is used for expansion and modernization purpose and also for revival of sick Public Sector Undertakings. 6. Fill up all vacant posts and lift the ban on recruitment. 8. Regularise all daily rated workers/employees/;Grameen Dak Sewaks and remove the ceiling on compassionate appointments; end the discrimination in the bonus ceiling of GDS employees. 10. Guarantee right to strike as a fundamental right of employees. The National Executive of the Confederation met today as scheduled; discussed the steps to be taken to ensure large participation of Central Government employees in the impending strike action of 7th September, 2010 organised by the joint platform of Central Trade Unions and Federations of employees and took the following decisions. (4) The affiliates may add as an annexure described as Part II demands which are department specific and which are pending settlement for a long time. (5) The State Committees and affiliates will chalk out campaign programme to cover the districts and other regions. (6) The Confederation CHQ will prepare campaign material in the form of brief note on each of the demands in the charter and place the same on its website. (7) Demonstrations will be organised at all State Capitals and other regional centres jointly by all participating affiliates on 6th September, 2010 and the members advised to participate in the joint rally organised on the same day by the Central Trade Unions. (8) The Confederation and its affiliates will participate in the March to Parliament programmes organised by the Central Trade Unions after the strike in pursuance of the acceptance of the demands by the Government. (9) Confederation will take independent initiative in organising campaign and action programmes in pursuance of the common issues of the Central Government employees after the strike action. (10)The Confederation CHQ will ensure that the Dharna programme decided upon earlier to protest against the vindictive actions in the IA & AD Department is staged in those State Capitals, which could not be organised on 5th. The National leaders will go over to such State Capitals along with the National leaders of the All India audit and Accounts Association. (11)The affiliates will make the subscription dues pertaining to the F.Y. 2009-10 immediately. (12)The Nationals Council of the Confederation will be held at Mumbai in December, 2010. 7th September Nation wide General Strike. As you are aware, the Central Trade Unions, except the BMS, jointly held a National Convention at Mavalankar Hall, New Delhi on 15th July, 2010. The convention was also attended by the representative of all Federations and Associations of employees and workers. The leaders of AISGEF, AIDEF and Confederation of CGE and workers also participated in the Convention. The said convention unanimously adopted a declaration calling upon the workers and employees in the country to organize a One day General Strike on 7th September, 2010 to oppose primarily the neo-liberal economic policies of the Government of India and its impact on the working class. The copy of the declaration adopted is enclosed. The convention has decided to highlight five important issues that affects the livelihood of workers in particular and poor people of the country in general. In the wake of the unprecedented unity of the working class of our country we have decided to ensure that every member of our organizations do take part in this historic strike on 7th September, 2010. In order to mobilize the Central and State Employees and Defence workers it is decided to hold conventions at all State capitals and other important workplaces jointly by the three organizations. The State Committee of the three organizations are requested to kindly interact and ensure that the joint convention is organized at their respective places on the dates indicated. It will be difficult to entertain any request for a change of date for it will jeopardize the schedule and affect adversely the conduct of conventions elsewhere. It is also decided that along with the demands adopted by the National Convention of Central Trade Unions, five important issues of importance to all Government employees should be included in our Charter. The charter of demands in pursuance of which the strike would be organized is as under:- These issues may be popularized amongst the employees and may be explained at the State/District wise conventions. The State leaders of all the three organizations are also requested to organize such conventions at other important towns and cities in their respective States. 8. Regularise all daily rated workers/employees;Grameen Dak Sewaks and remove the ceiling on compassionate appointments; end the discrimination in the bonus ceiling of GDS employees. Date of convention. organizations deployed to attend the convention. 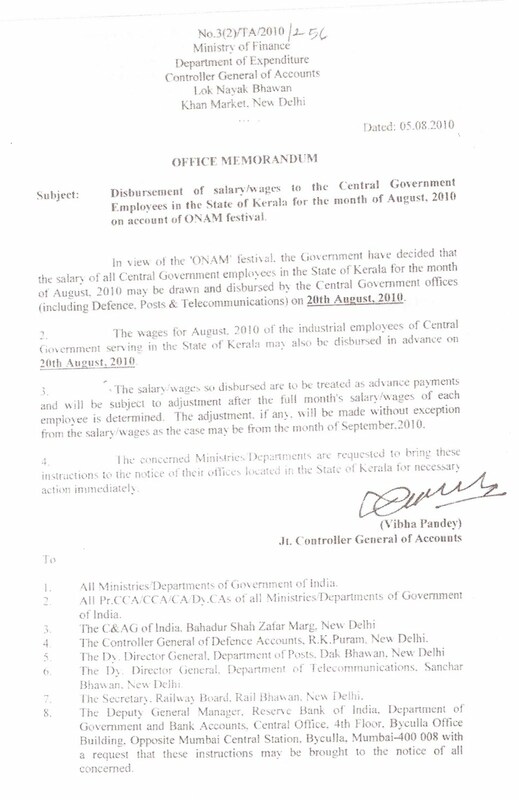 Disbursement of salary/ wages to the Central Govt. 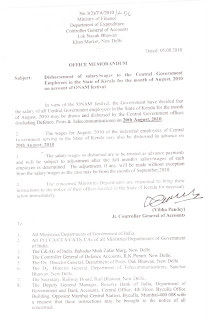 Employees in the State of Kerala for the month of August,2010 on account of Onam Festival.